GIANTS men really have existed? 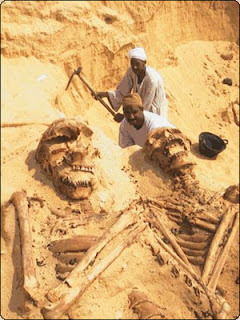 Who are the Giants are really existed? Surely it is known that every single fact about this discovery that could revolutionize the whole story,the exhibits or evidence are always hidden or destroyed forever. One thing is sure that the more we go back in time to the boulders over the works to build fortresses and colossal monuments are giants,yet no one gave an explanation of how a certain size from gigantic stones, and several tons may have been made ​​and embedded with each other without any material to merge them together. An explanation for me is not strange that in a time you think about 12000 BC there have been men of large size of up to 4 meters with a force appropriate to raise such boulders. In Sardinia there have been some dramatic discoveries about the giants, in particular Arbarei Pauli,but nobody wants to carry out the excavation; the superintendence pretends nothing so much evidence of local people to have found bones of giant size, but not animals even men of considerable height of 4 meters. The same joints of the stones they can find thousands of kilometers, but close and overlapping with the exact same technique ... it seems that the same hands have built every where in that time.